The user operates the R&S NRX RF power meter via the integrated high-resolution 5" touchscreen. Rohde & Schwarz has equipped the new RF power meter with a touchscreen based operating concept that guides the user through configuration. The R&S NRX has up to four measurement channels, for which Rohde & Schwarz offers a wide range of power sensors. For the first time, both terminating and directional power sensors are supported in a single instrument. High-precision RF power measurement for modern applications is a challenge. Rohde & Schwarz is launching the R&S NRX on the market so that users can transparently configure their measurements and perform them conveniently. The R&S NRX even makes it possible to perform triggered and synchronized multichannel measurements with different power sensors. The user operates the instrument via the integrated high-resolution 5" touchscreen. Measurements are configured using large buttons. The system supports the user with a logical calibration and draws attention to conflicts in case of doubt. If required, the instrument can also be operated using the buttons on its front panel. The R&S NRX comes as standard with two robust sensor ports, which can be optionally upgraded to four. In addition, sensors can also be connected via USB or Ethernet. The user can connect all terminating power sensors from the Rohde & Schwarz portfolio to the sensor connectors. The R&S NRX-B9 sensor interface module integrates the directional power sensors of the R&S NRT-Z family into the measurement to determine power in both transmission directions. With the optional R&S NRX-B1 sensor check source module, users can test sensors for a pending measurement. The high-precision 50 MHz/1 GHz reference generator module generates continuous-wave signals as well as pulsed steep-slope signals. Rohde & Schwarz will present the R&S NRX power meter from March 19 to 21, 2019, at EMV 2019 in Stuttgart (hall C2, booth 619). 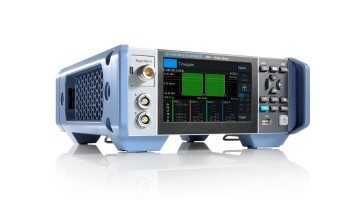 It is available now from Rohde & Schwarz, and will soon be available from select distributors. The R&S NRX is superseding the proven R&S NRP2 power meter. For more information, visit www.rohde-schwarz.com/ad/press/nrx. The Rohde & Schwarz technology group develops, produces and markets innovative communications, information and security products for professional users. The group's test and measurement, broadcast and media, aerospace | defense | security, networks and cybersecurity business fields address many different industry and government-sector market segments. On June 30, 2018, Rohde & Schwarz had approximately 11,500 employees. The independent group achieved a net revenue of approximately EUR 2 billion in the 2017/2018 fiscal year (July to June). The company has its headquarters in Munich, Germany. Internationally, it has subsidiaries in more than 70 countries, with regional hubs in Asia and America. R&S® is a registered trademark of Rohde & Schwarz GmbH & Co.KG.